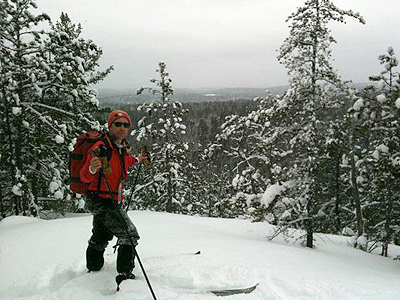 While Ontario may not be known for its abundance of mountains it does have several rolling peaks and escarpments that provide more than adequate vertical for backcountry skiing, especially in the North. Vertical gains range in the area of 500 - 1,000 feet and snow is typically plentiful given the northern latitude. The lack of people and endless wilderness also add to the magic of this area. Why go to all the effort of planning a trip west when there is some pretty descent ski touring right in your own back yard! We want to hear about your adventures in Eastern Canada so don’t forget to post a trip report in the backcountryskiingcanada.com forums. If you have new route in the area you want to share, mouse-on over here. N-Joy. The route shown below is provided by friendsoftemagami.org. If we have missed anything please let us know? Nice descents through open jack pine forest on the northwest slopes. The Ottawa-Temiskaming Highland Trail (OTHT) hiking trail continues south along the edge of the ridge. There are also descents at the south end of the ridge through more dense pine forests. There is a small canyon running NW/SE on top of the ridge. There may be some nice skiing east of this, the ridge actually maxes out at 615' vertical in this area. Start by skiing down the road and turn left at the fork. Cross the train tracks and go on to Rib Lake. Note there are private cottages and a lodge in the area, please do not cross private property. Ski across Rib Lake to the Cliff Lake portage. Ski approx. 500 m over to Cliff Lake. Proceed into the northeastern bay, where there is a series of portages toward Friday Lake. After about 100 m, the OTHT joins the portage from the left (north). Stay right. After a few hundred more meters, the OTHT leaves the portage and turns right (south). Follow the hiking trail up the ridge to the top. ACCESS: Highway 11 between Temagami and Latchford. Park at the beginning of Bay-Lee-Mac Road, 19 km north of the town of Temagami. The road is not snow plowed, but there is usually a cleared area to park.